An incomplete copper alloy vessel fragment of medieval to post-medieval date. Only the handle remains which is V-shaped with a circular section and fluted, flat topped terminals to either end. The handle is undecorated and both terminals are worn. The metal has a dark greenish-brown patina. The handle is 84.4mm long, 13.6mm in diameter (24.6mm in diameter at widest terminal) and weighs 122g. 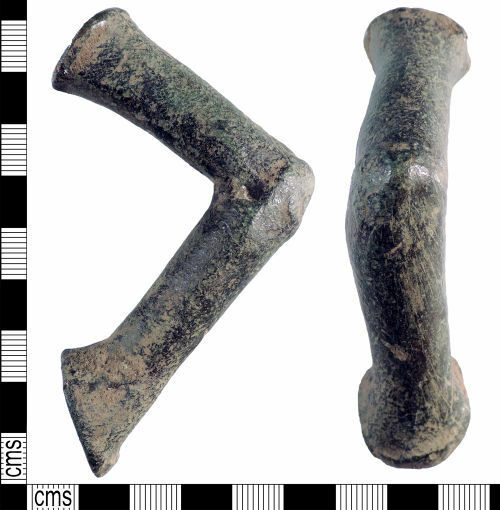 This handle is likely to be from a large cooking vessel such as a cauldron and dates from c. AD 1100 to c. AD 1850 when the use of cast iron cooking vessels predominates. A parallel is illustrated in Egan G. (1998) The Medieval Household Daily Living c. 1150-c.1450, p.163 and numerous similar examples have been recorded on the PAS database. For examples see YORYM-856185, WAW-3D60B8 and SWYOR-89CC21.